Celebrate the new year in HISTORIC DEADWOOD! You’ll find live bands, nightclub music, drink specials, and thousands-upon-thousands of dollars in giveaways up and down our cobblestone streets. Stay tuned to this page as we update you with New Year’s Eve parties happening around town. 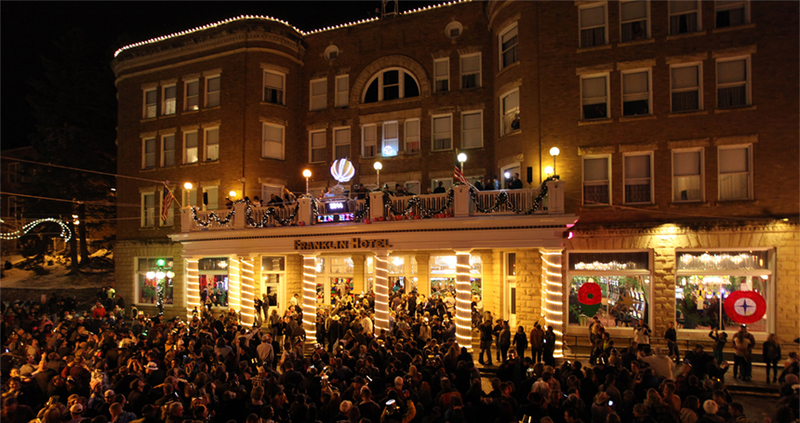 At midnight, bid adieu to 2018 as the ball drops at the veranda of the Historic Franklin Hotel on Main Street — a Deadwood tradition. Enjoy the New Year’s Eve Buffet at the Grand Buffet and celebrate with thousands of dollars in promotions and giveaways at their casinos. Deadwood Gulch Gaming Resort will be hosting a $26,000 cash giveaway weekend! There will be $100 – $400 drawings on New Year’s Eve, plus one player will win $2,019 in cash at midnight! There will be free champagne and favors, a New Year’s Eve buffet, and a New Year’s Day $1,500 Cash Slot Tournament. More $100 – $400 drawings will happen on New Year’s Day and there will be one more $2,019 cash winner. Please pick up your party favors at the Player’s Club and enjoy the party! For more information visit www.deadwoodgulchresort.com/casino/promotion/new-years-weekend. Enjoy FREE live music at Santana’s Sports Bar by Tie Dye Volcano on Friday, Saturday, and Monday nights starting at 9 p.m. On New Year’s Eve enjoy free hors-d’oeuvres, free champagne at midnight, free party favors and drink specials all night long. There will also be decadent food specials including Steak and Lobster in Six String on New Year’s Eve. Reservations are recommended. In the casino, they will be giving away Double Hot Seats from 2 – 6 p.m.on New Year’s Eve day for a total of up to $7,000 given away in just four hours. First Gold will be giving away $58,750 during their New Year’s Celebration from Friday, Dec. 28 – New Year’s Eve. Enjoy the New Year’s Eve buffet on Monday, Dec. 31 from 4 – 10 p.m. The menu includes Prime Rib and crab, BBQ ribs, fried cod, Cajun Tortellini, Chicken Cordon Bleu, fried shrimp, mashed potatoes and gravy, Island Blend, sweet corn, fresh rolls, a full soup and salad bar, assorted desserts, and soft serve ice cream. The cost is $27 for adults, $7 for children ages 6 – 12, and children 5 & under eat free! Additionally, the Deli will be open on New Year’s Eve from 9 p.m. to 3 a.m. Celebrate the New Year with $500 all cash Hot Seats at the Lodge at Deadwood. Random winners selected every 20 minutes on New Year’s Eve (2 p.m. – 2 a.m.) and New Year’s Day (noon – 6 p.m.). To win, simply use your Club 76 card in any slot machine, at the card tables, or in the Rounder’s Poker Room. When you win, your buddy wins too! Winners may choose a buddy to receive $25 in promo. Buddy must be present and a Club 76 member. Enjoy a dinner for two that will bring you luck and good fortune in the New Year! $39.95 (plus tax) on Monday, December 31 enjoy baked lemon Keta Salmon, served with prosciutto wrapped asparagus, wild rice with mushrooms, havarti and dill tarts, and chickpea and tomato salad over greens. Full menu also available. Two guests will find a silver Mineral Palace coin hidden in our Tulip Cups with raspberry mousse to make their 2019 lucky! Toast the New Year on the casino floor with 12 grapes to signify good luck for the next 12 months. Enjoy karaoke at the Oyster Bay on Friday, Saturday, Sunday, and Monday night starting at 7:30 p.m.
Big Skillet will be performing live starting at 9 p.m.